Squeeze the lemons. Save some of the pulp. Throw out the rinds and the seeds. 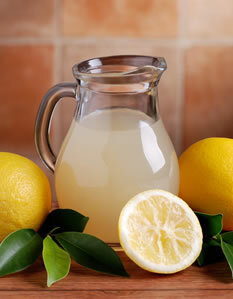 Pour the lemon juice into a large pitcher. Add the water. Add the sugar and stir together. Put the pitcher into the fridge for an hour or so. Stir again before serving. Add some ice cubes and enjoy. Tip: To make it fancier, scrub off the outside of another lemon. Slice it into rounds and add one or two rounds to the outside of the pitcher, hanging off the side. Reprinted with permission from Let My Children Cook! by Tamar Ansh. Let My Children Cook! makes it easy for kids to share in the fun of cooking - at a time of year when parents can really use the help. Geared to children ages 8-15, it includes over 80 recipes, cooking and safety guidelines, and important lessons, such as washing hands before cooking and cleaning up when finished.